A blessed probably equates to a comfortable life with sound health, an abundance of happiness, fewer problems and harmony at home. Many people are living abundant life because they’re choosing to keep their eye on their personal surrounding. Hence, living a blessed life is a matter of managing your space. Stay blessed is not just to be wealthy by the world’s standards, but enjoying a quality of life that most millionaires would envy. It includes every aspect of your life—health, relationships, work, family, emotions, and, also thoughts. The secret of the universe is found in energy, frequency, and vibrations. These are again channelized through five elements of Vastu Shastra. Feeling a blessing in life requires your house energy to flow positively. Vastu helps you to strengthen and spiritually energize your environment with positive vibes. You spend most of your time in your living as well as working environments, shouldn’t you make it work for you? We all find ourselves affected by people, events and even surroundings. A negative interaction may result in arguments, sickness, depression, and loss of material wealth. 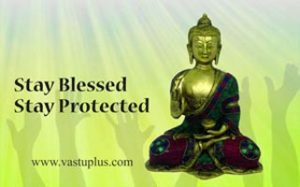 Vastu offers a number of ways to keep you protected from illness and sick energies. A perfect meaning of tranquility is “a state peace and quiet”. According to Vastu Guidelines, a North-East direction represent a tranquility zone of your space. This direction is regarded as highly surcharged with divine energies. Spend some time daily here to relax your mind, connect with your Source, and develop your spiritual life. This space should be clutter free and comfortable. Avoid any kind of distractions. Place it away from television, mobiles, computers, audio, electrical equipment and, also router. You may be following many Gods or goddesses but minimize the focus into one God or goddess to get the best results in your life. North-East is a most honored sector and should not be treated as “leftover” space. When you create a space for altering, you start accumulating the power needed to support your dreams and staying blessed. Tithing is a secret ingredient and recipe to live a prosperous and wealthy life. The most important rule of prosperity whether we like the idea or not is to tithe. To “tithe”(donate) means to give a tenth or 10 percent of the income. So it has been interpreted that a tenth of all money, regardless of how you obtain it must be donated. Giving makes you more blessed then getting. In a 2006 study, Jorge Moll and colleagues at the National Institutes of Health found that when people give to charities, it activates regions of the brain associated with pleasure, social connection, and, also trust. A 2008 study by Harvard Business School professor Michael Norton and colleagues found that giving money to someone else lifted participants’ happiness more than spending it on themselves. “Charity given to a worthy person simply because it is right to give, without consideration of anything in return, at the proper time and in the proper place, is stated to be in the mode of goodness”. Negative vibrations (negative thoughts and feelings) = negative situations in our lives. Positive vibrations (positive thoughts and feelings) = positive situations in our lives. Even in the most positive of the house, negative energy can gather. There are so many ways in which negative energy gathers or is generated in your place. A visit to negative sites, interacting with others can pick up a garbage in your energy field. We are like magnets. Negative people can and do influence positive people. Negative person’s aura can drain the positive person’s aura as well as Energy. The positive person will feel it when it happens – they may feel more exhausted, tired or weaker, their mood may lose some sparkle, or also they may get a feeling of uneasiness or anxiety. Creating the perfect environment at your home or office is fundamental for you to start thriving, being happier, more focused and relaxed. Being around positive people is one of the best things you can do to get more positive vastu vibrations in your space. THE LESS YOU RESPOND TO NEGATIVE PEOPLE, THE MORE PEACEFUL YOUR LIFE BECOMES. Residue builds on walls and in corners of every home and office on a daily basis with thoughts and words that are spoken and people working or living there become stuck and their environment result in energetic blockages. Clutter-free surroundings make you happier, more creative and, also productive. When your space is clear, inspiration is a natural outcome. A space purification process removes undesirable energy from houses, businesses and, also property. After clearings are done and obstacles and energetic limitations are removed, balance and harmony are restored. CLUTTER ISN’T JUST A STUFF ON THE FLOOR. IT’S ANYTHING THAT GETS BETWEEN YOU AND THE LIFE YOU WANT TO BE LIVING.